Mobile Marketing allows mobile marketing campaigns to be planned and launched by marketers in minutes, allowing timely alerts containing mobile coupons, special offers, rewards, text-2-win announcements or links to mobile friendly websites to be deployed and tracked with all the analytics needed to make the decisions necessary for the best ROI. There Are Many Different Mobile Marketing Methods to Engage Your Customers and audience. We recommend opt-in text messaging campaigns that have a clear call to action using any of the following suggestions. Business Cards, Flyers, Signs, Door Hangers, Billboards, Television, Radio, Kiosk, Digital Signage and Website. 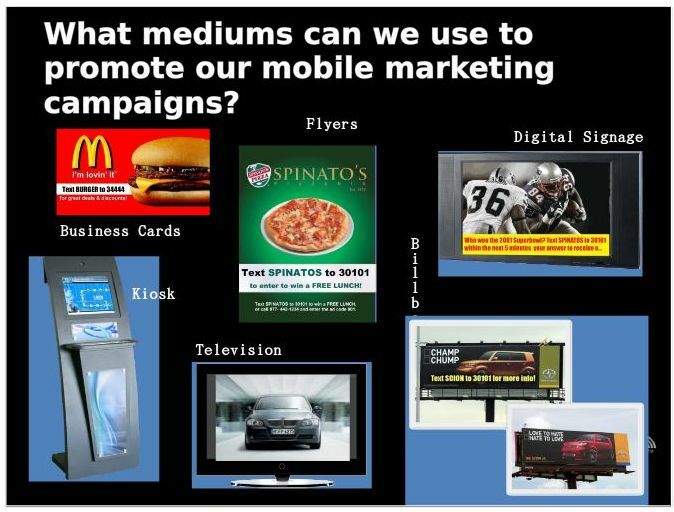 Mobile marketing promotions can be at the center of all cross-media marketing. The mobile coupon can be a simple text message that says, show this text to get 15% off at our store location this weekend or something similar. Mobile coupons are often delivered as SMS, text message or as a graphically rich (MMS), or as a 1D or 2D, barcode otherwise known as QR code. Mobile Marketing Campaigns are intended as a complement to your existing marketing campaigns. The contact device is the “keyword” (your unique tracking method) and “short code” (Is the technology platform for interaction). The keyword and short code can be added to any existing marketing channel: Sign, Online, Print, Radio, Television, etc. – Provide information on the go. Upcoming events, contests, coupon or other special offers, or even directions to your location. – Just in time offers/Not available elsewhere. 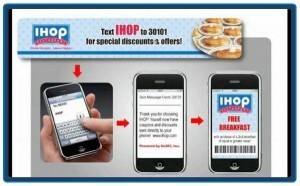 Send your opt-in mobile subscribers a special offer in real time that is only available to text messaging subscribers. Allow them to redeem the offer immediately, using their wireless device. – Encourage Interaction. Ask recipients to participate in a poll, survey or contest. The process is so simple. For example, a keyword and short code is added to a sign that is attached either inside or outside your building. The prospect responds to the message or special offer via their mobile phone. The prospect is invited to “opt in” to receive more information on the offer. Once opted in, the customer is yours to communicate with on an ongoing basis. The perfect way to keep your customers coming back again and again. Did you know that 90% of text messages get read within 3 minutes of receiving them? 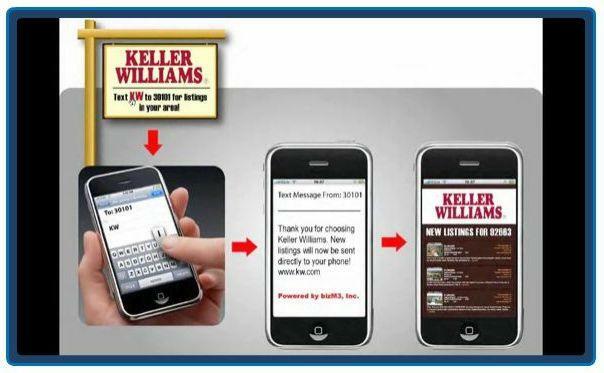 Now for those of you that have a larger marketing budget, imagine using this kind of powerful mobile text marketing interaction within a radio or TV commercial. 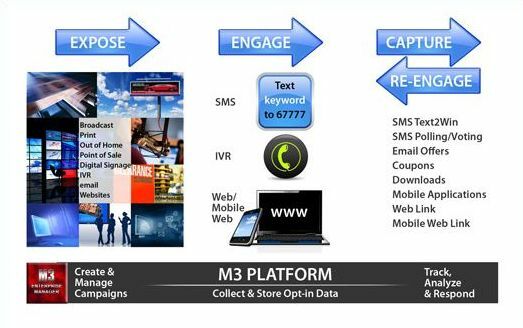 Use an interactive call to action with all your marketing campaigns by simply integrating mobile short code marketing. 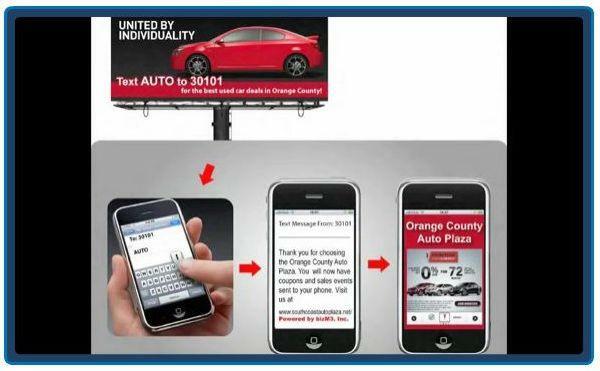 Picture Below illustrates an example of an automobile mobile campaign. When using mobile marketing technology, you will be in control of your campaign development and execution unless you choose an agency to do it for you. – You can find mobile marketing companies that will license you the technology to run your campaigns, and provide you the quantity of keywords you need for ongoing creative development and campaign management. Many platforms will provide different packages of bulk text messaging transactions, making it easy to forecast the cost of the campaign. Packages can be scalable to accommodate success. – When you decide to do your own campaigns many mobile marketing providers will provide you with “back office” functionality to create and execute campaigns, track results and manage the ever-increasing database of customers or respondents and provide training. – You then create your campaign and begin the marketing process. Campaign and Media performance feedback. Real time response Data Capture. Mobile is poised to become the most widely utilized media channel in the world! Source MMA, Mobile Marketing Association. Mobile phones represent the most personal way to communicate with individuals. In a recently released report, Nielsen highlights how brands can reach practically every mobile consumer in the US by adding a mobile address, a Common Short Code to their marketing mix. of all types, Advertising Agencies, Media Companies, Restaurants, Publications, Schools, Car Dealers, Surf Shops, Motorcycle Dealers, Grocery Stores, Clubs, Musicians, TV and Radio Stations, Casinos, Hotels, Health Clubs, Spas and Salons, Fast food Chains, Banks, Retail Stores, Resorts, Digital Signage Networks, Professionals and Brokers just to name a few. If you are one of those companies that require a dedicated short code, you will just ask your Mobile Marketing Provider. Online Marketing Strategies and Opportunities © 2019. All Rights Reserved.